Possibly one of the first enterprises of the MacLaren family on acquiring land from [pioneer] Joseph Irwin was the establishment of a general store. This stood facing the Gatineau River, downstream from the [MacLaren] mill complex. Recent articles by Archie Pennie and Carol Martin in Up the Gatineau! Volumes 21 and 23 have mentioned a connection between Franchot Tone and the Gatineau Fish and Game Club.To many of us old-film buffs, the face of Franchot Tone is a familiar one, but who was grandfather Franchot and what attracted him to Buckingham?The writer’s files on Outaouais mining provide some answers to these questions. The life of settlers in the Gatineau and Pontiac cannot be imagined without the special dimension it gained from the life and lore of the shanties. At the height of the lumber industry – between 1870 and 1900 – there were dozens of camps run by large companies in both the Pontiac and upper Gatineau. “There were ten thousand men working on the Black and Coulonge rivers alone. In 1846, a “group of inhabitants residing near the banks of the Gatineau river” sent a petition with 180 signatures to Quebec asking for assistance in the construction of a road going north from Hull for a distance of seventy-five miles (125 kilometres). The request specifically mentioned the need for a bridge over la Pêche River at Wakefield. The railway changed much of the valley’s history, as did the paddle-steamers on the Ottawa River. Bridges and dams came next. Until bridges spanned the rivers, the only way to cross was by scow, and only in summer. Just as the steam-operated vessels which plied the Ottawa River between the mid-1830s and the mid-1940s could only operate in summer, so the ferries crossing larger and smaller rivers in the region were also entirely dependent on the season. 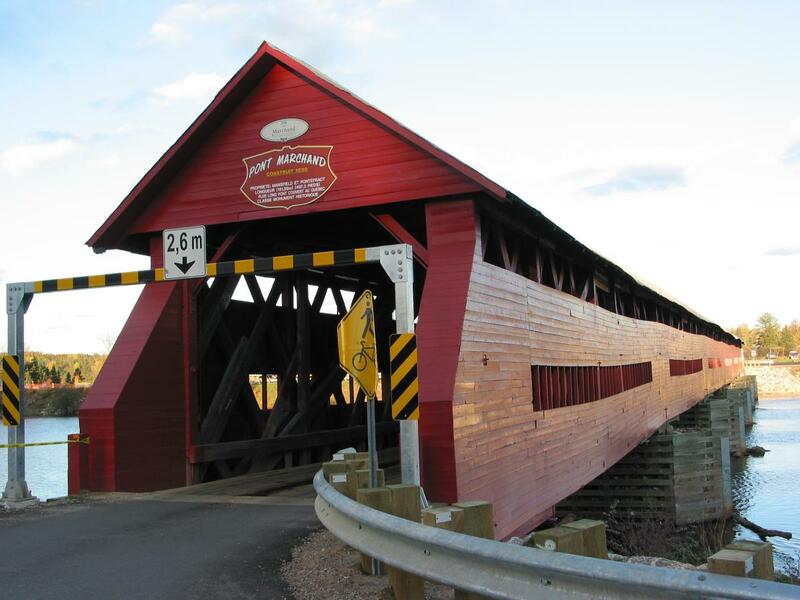 In this age of cement and steel, the massive Marchand covered bridge in Fort Coulonge seems a throwback to an earlier time, a time when building a covered bridge, even one of this magnitude, was a common occurrence. The Gatineau River has always been an important transportation route. It was well known to the various Indian Nations of the Ottawa and St. Lawrence valleys and it was used extensively as a highway for seasonal travel. It was only in the early 1800s that permanent settlement occurred in the Gatineau Valley. Beginning with the American Philemon Wright’s settlement of Hull in 1800, colonization gradually extended north. No topographical feature so dominated the landscape and the economy of this area as did the Chaudière Falls. Their presence on the river determined the locations of the cities of Ottawa, Hull and Aylmer, and made necessary the building of the Aylmer Road that bypassed them. The falls fueled the industrial explosion of the mid-1800s by providing the water power for the vast complex of lumber and grist mills that grew up at their foot. They generated the electricity that drove the railroads and factories in the area after 1885.